British girl band Little Mix, came with astounding number "Black Magic" on 21st of May, 2015. Released as a lead single from their third studio album Get Weird. The song gained enormous traction among the listeners, appreciating it's bombastic beats and a highly engrossing music video. Compared to their previous albums, DNA and Salute, Get Weird sold better,getting heavy airplay.. thanks to single "Black Magic". The music video of the song is super entertaining and reminds one of the 90s U.K super Girl Power band, Spice Girls. "Black Magic" has left a permanent mark in the viewer's mind for its flamboyant swag and pompous beats. While making this song, Little Mix had to cancell their U.K tour to completely focus and dedicate themselves to this single,so that they can get it right. Changing their music completely from soft pop to uptempo pop, they re-entered the music world, equipped with highly addicitve beats and super sleek looks. As it was completely different from their earlier compositions,they described "Black Magic" as a 'huge risk’ before its launch, worried that their existing fan base many not be impressed with the new beats. On May 14th, 2015, the song title was revealed as "Black Magic" by Little Mix along a 30 second teaser. The dance number 'Black Magic' was written by Henrik Michelsen, Ed Drewett, Edvard Forre Exford and Camille Purcell and producers of the song were Production Duo Electric. This three minutes and thirty-one-second song created a sensation in the whole music industry. Inspired from the Joyful hymns of dance music of the 1980s,the song has acadence of 122 beats per minute, which is amazing in itself. The official Charts Company's production UK Singles Chart lists the uppermost selling singles. The list is prepared on the basis of paid-for downloads, streaming, and physical sales. 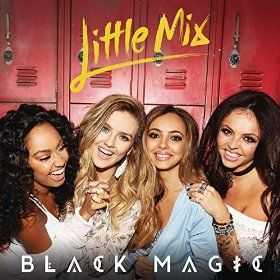 "Black Magic" got listed in the singles chart and managed to remain on top for more than three weeks. With supreme sales of 1,13,000,it topped the UK official charts with ease. At the 2015 Teen Choice Awards, it was selected for Choice Love Song. With more than 287 million views and 1.811 million likes on YouTube, the music video resembles a typical 90s Disney Channel movie where 4 nerdy school girls (Little Mix band members - Perrie Edwards.Jesy Nelson. Leigh-Anne Pinnock. Jade Thirlwall.) gets mocked and thrashed by every other student in the school. All the 4 girls adore a guy at school, while Perrie loves him crazy, but none of them can get near him as he is 'completely stumped' over a blonde. One day in the college library Jade was looking for book on magic and craft, on the lower racks of the library stand, while a real Book of Magic falls on her head from one of the top racks of the library book stand. Befuddled she looks at the book, takes it to her friends and later in the night at the college dormitory they hold each others hands, practice the magic spells,get stunningly beautiful with super powers. The very next day at the school, the girls spot the afro guy with the blonde and they a put a spell on the blonde girl,in such a way that foul smell comes between the her legs..as her boy friend, the afro guy covers his nose, to prevent the unbearable stench from entering his nostrils. The blonde runs away and the 4 girls move on, when they spot a nerd with glasses..mining through his books, they put a spell on him and kiss him, suddenly he becomes super attractive as all the girls around him start to kiss and caress him. The 4 girls finally head to the classroom,where an afro professor is teaching advanced mathematics class..the girls bored to death transform the classroom into a discotheque as everyone in the classroom including the professor gets up and dances.In the end the 4 nerdy girls become the most popular students in the college. "Black Magic" sold half a million copies in the U.S..gained a Gold certification, 600,000 (official) copies in the U.K, reaching the no.1 spot in the U.K charts, was awarded a Platinum certification and sold more than 1.5 million copies around the world.